With Windows XP reaching the end of its long support life, many businesses and individuals are avoiding Windows 8 and upgrading to Windows 7 instead. If you’re a latecomer to Windows 7, here are the basics you need to know. Sure, Windows 7 is different — and, after 13 years of Windows XP, anything different will be a huge change. But it’s a worthy successor to Windows XP and is more secure, polished, powerful, and modern. 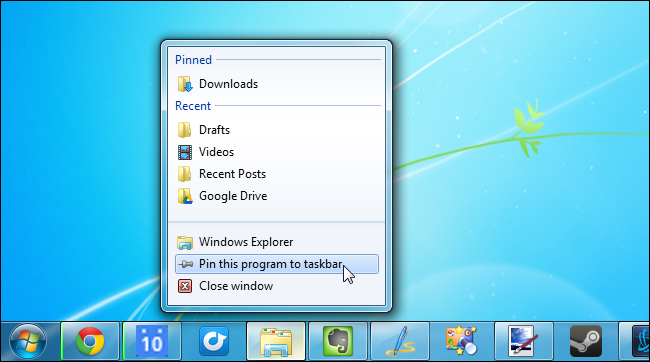 Windows 7’s taskbar is different from Windows XP’s. Windows XP offered a “quick launch” area with shortcuts you could click to launch programs as well as a taskbar with a list of all your open windows. In Windows 7, these are basically combined — the icons on your taskbar now represent both shortcuts to programs and open programs. An icon with with a border around it is a running program, while an icon without a border isn’t running yet. Just click a program’s icon and you’ll switch to its window if it’s running or open it if it’s not yet running. Programs you open will appear on your taskbar while you’re using them, but they’ll normally vanish from your taskbar when you close them. To make a program’s icon always appear on your taskbar, just right-click the program’s icon while it’s running and select Pin this program to the taskbar. The shortcut icon will now appear on your taskbar whether it’s running or not. You can drag and drop it to rearrange your taskbar. When you right-click a taskbar icon, you’ll also notice the program’s “jump list.” This list provides access to recent files and other common settings. For example, if you have Word on your taskbar, you can right-click the Word icon and select a recent document to open it quickly. The taskbar also groups a program’s multiple windows into a single taskbar entry. Just hover over or click the icon and click the window you want. 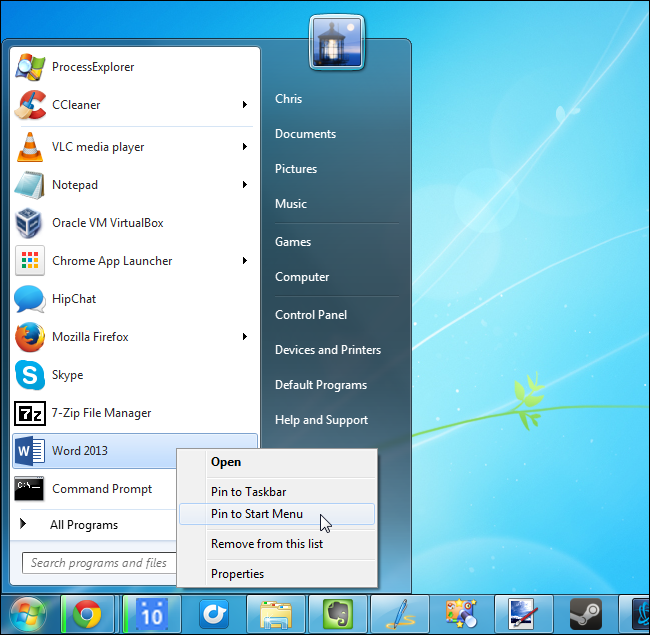 You can also just click the taskbar icon button multiple times to switch between a program’s windows. if you don’t like the new taskbar, that’s fine. You can get a Windows XP-style taskbar back by right-clicking the taskbar, selecting Properties, and adjusting the Taskbar buttons option. The Use small icons checkbox here will also make the taskbar smaller, freeing up some screen space. 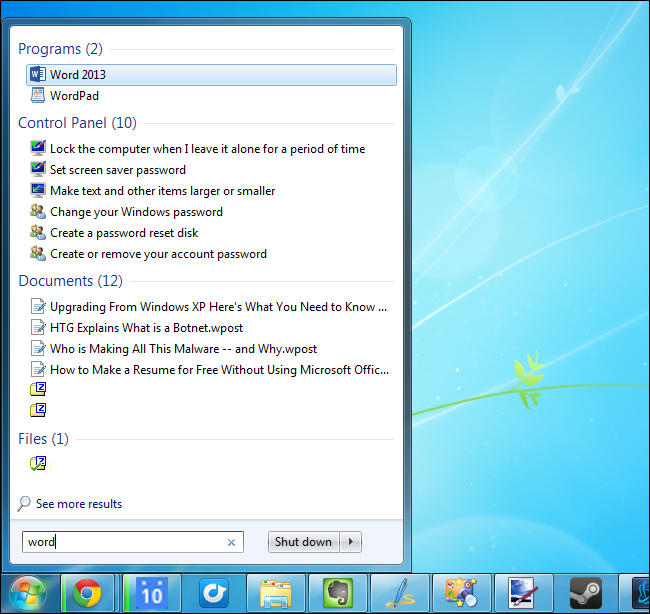 Windows 7’s Start menu looks different from Windows XP’s, but it shouldn’t be hard to get used to. When you click the Start button or press the Windows key, you’ll see a list of your frequently used programs. This list automatically updates to provide you with the most useful shortcuts. You can also have a shortcut always appear at the top of your Start menu by right-clicking the shortcut and clicking Pin to Start Menu. The right side of your Start menu provides easy access to common locations like the Control Panel and folders on your computer. You can click All Programs to view all the programs installed on your computer, but this isn’t the most efficient way to launch programs. To quickly launch a program, just start typing its name into the Start menu to search for it and press Enter. You can also search for files on your computer from here. Just tap the Windows key and start typing. 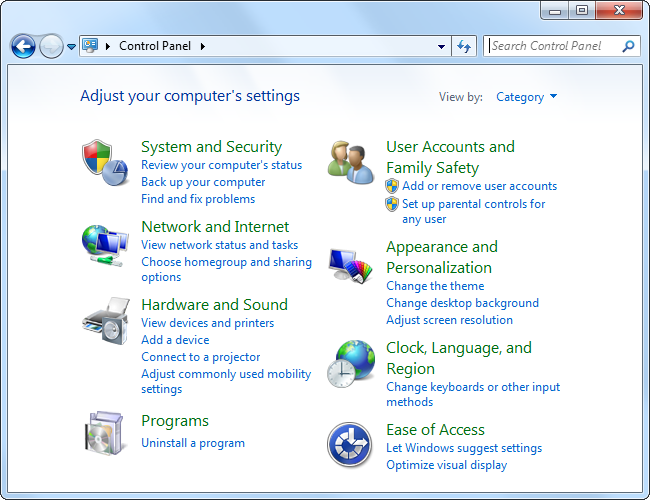 User Account Control (UAC) was introduced in Windows Vista and dramatically improved in Windows 7. This feature allows your user account to use limited permissions most of the time, prompting you when higher permissions are required. 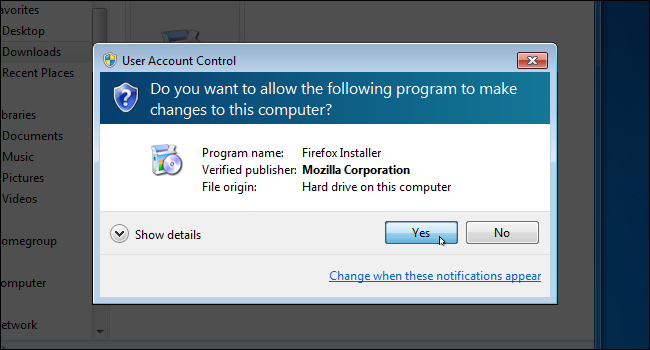 For example, you’ll have to agree to a UAC prompt before installing most programs on your computer. This provides additional security, as programs on your computer can’t write to system files without prompting for permission. UAC doesn’t annoy you too much. You’ll see quite a few UAC prompts when you’re setting up your computer and installing software, but you won’t see them very often after that. Leave UAC enabled and only accept UAC prompts you expect — for example, agree to the prompt you see when installing a program. 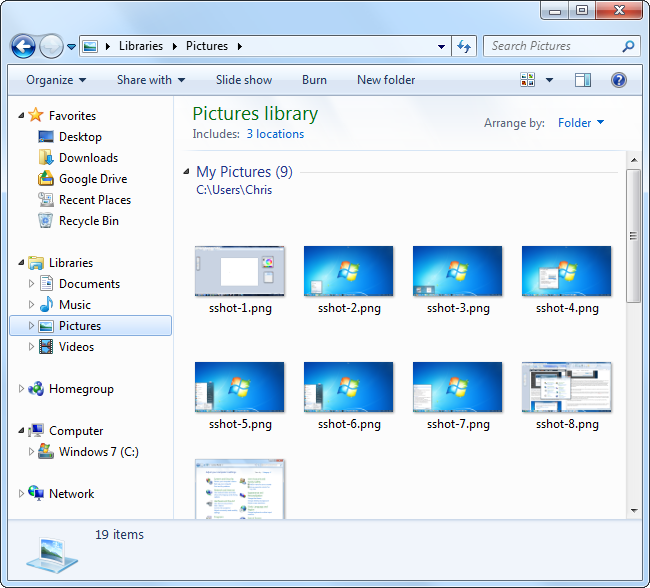 Windows Explorer looks different, but works similarly. It includes you with a toolbar instead of the traditional File/Edit/View menu, but you can actually press Alt to temporarily reveal that hidden menu — this also works in other similar applications, like Internet Explorer. The Windows Explorer window provides you with quick shortcuts to your most important folders in the left pane. Downloads will appear in your Downloads folder by default. There are also Libraries, which are “virtual folders” that show the contents of multiple folders. For example, your Documents library contains the C:\Users\NAME\Documents folder, as well as any other folders you add. You should likely store your personal files in these libraries, or at least folders under C:\Users\NAME , where NAME is your user account name. This is your user account’s personal data folder. 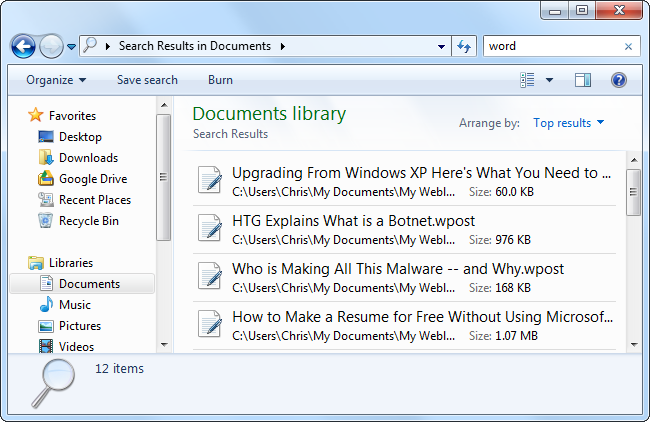 Windows Explorer also has a built-in search feature you can use to quickly search your computer’s files. Windows builds an index of your files in the background so this will be as fast as possible. The Homegroup feature allows you to easily network multiple Windows 7 and Windows 8 computers together for file and printer sharing. If you ever tried to set up home networking between Windows XP systems and struggled, you’ll find it’s shockingly easy to set up a Homegroup in Windows 7. The Control Panel displays categories and links by default. You can still display a traditional icon view by clicking the View by option at the upper-right corner, but you don’t really have to. The easiest way to find a setting in the Control Panel is with the search box — just search for the setting you want to use with the built-in search box. You can also find Control Panel settings by typing them into the search box in the Start menu, so you can go straight to a particular setting without needing to open the Control Panel at all. There are many more new things to learn in Windows 7, but it shouldn’t be too daunting. Windows 7’s interface has a lot in common with Windows XP’s.